First things first: broken capillaries aren’t really broken: this term simply describes the condition where red, bruise-like spots are found on the cheeks, nose and chin. 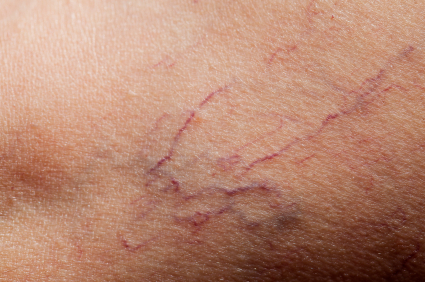 When skin is injured or irritated, the thread-like veins beneath the outermost surface of skin become visible to the naked eye and remain as permanently dilated capillaries. They can appear as red or blue in color. Red-colored ones are arterial capillaries and are easier to prevent and treat than the blue, venous capillaries that lie deeper in the skin. Broken capillaries are actually quite common – they happen to nearly two-thirds of the population over 30 years of age. Fair-skinned individuals of western European descent (e.g., Irish or Scottish) or those with dehydrated, sensitive, thin skin or people who suffer from Rosacea are most susceptible to experiencing broken capillaries. When the capillary walls contract and expand too quickly, the muscles in the wall tear and allow blood to seep through. Repeated dilation from hot water/showers, microdermabrasion, spicy foods, alcohol, intense exercise, or genetics leave these capillaries permanently dilated. If allergies or a cold have you blowing your nose, you might see visible capillaries around the corner of the nose and nowhere else. This doesn’t necessarily mean you have broken capillaries – it’s just from the chafing and pressure placed temporarily in that area. How can I treat broken capillaries? Professional treatment is advised in order to treat broken capillaries. However, there are plenty of measures one can take to prevent them or help decrease their appearance. Consult your dermatologist or family physician for more information. How can I prevent broken capillaries? Start mornings with a cool splash of water. Cool – but not icy – water will help reduce redness and calm the skin. Look for calming, anti-inflammatory ingredients. Azulene, Chamomile and Keratoplast are ideal. Wash with lukewarm water, always. Extreme temperatures can cause the capillary walls to narrow and widen quickly, therefore putting unnecessary strain on them – so while a hot shower might be tempting, keep in mind that hot water will only speed blood flow and increase redness. Hydrate your skin. Remember: dehydrated skin types are more prone to experiencing broken capillaries. Keep your skin well-moisturized throughout the day and evening to prevent irritation and unwanted redness. Cool it down. Need more than a splash of cold water? Try pressing a cool compress to your face before starting your skincare regimen (day or night); it will do wonders in calming skin and minimizing redness upon application. For a cooling treatment throughout the day, try storing your Rosewater Facial Sprayin the fridge for an instant refresher that keeps your complexion hydrated whenever, wherever. Any questions? Leave them in the comments below or speak to one of our skincare specialists at (800) BADESCU. Hmm…. WIll it really help? I have at least 5 broken blood vessels on my face,chest and arms they are very bright red pinpoint dots I can’t stand it I have one right on the side of my nose by my eye and one on the tip of my nose. Don’t know what to do . There really isn’t some type of cream or medicine ?